The first inaugural fest will feature Alex G, Elvis Depressedly, and more. 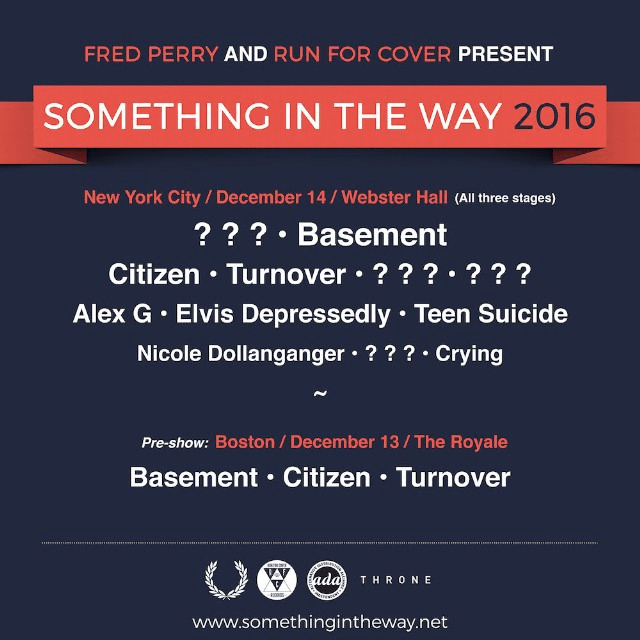 Boston indie label Run For Cover Records has announced the first inaugural Something In The Way festival on December 14 at Webster Hall in Brooklyn. The festival's lineup features Run For Cover signees and affiliates, including Alex G, Elvis Depressedly, Teen Suicide, Nicole Dollanganger, Crying, Basement, Citizen, and Turnover, with special guests to be announced closer to the event. Tickets for Run For Cover's Something In The Way 2016 festival will go on sale on September 30 at 12:00 p.m. EST on the fest's official website.